Come watch us dance through the decades! 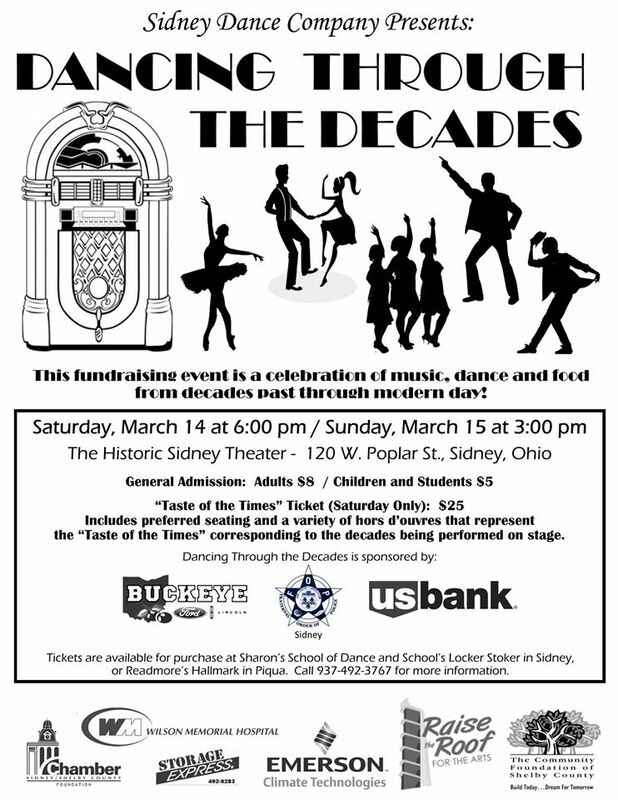 Sidney Dance Company is pleased to present our first ever performance fundraiser at The Historic Sidney Theatre! All proceeds go directly to the not-for-profit organization, to help fund what we hope will be a large musical next year. 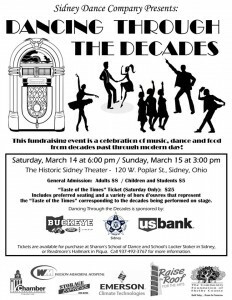 Saturday, March 14th at 6pm we will host this exciting show with a “Taste of the Times” available for those who want to indulge in era-specific tastings and hors d’oeuvres catered by The Bridge in Sidney. Tickets are limited and available for $25, get them before it’s too late! General admission tickets are $8 for adults, and $5 for students. A cash wine bar will also be available. We will also have a show, Sunday March 15th at 3pm. This show is general admission only with $8 tickets for adults and $5 for students. A meet and greet will follow where you can meet the cast, take a backstage tour and learn some dances of the decades (separate ticket required). The show is set to be just over an hour long, and tickets are now being sold online, and soon, at local businesses! We hope you will join us in the fun evening of dancing and dining in your favorite decades! This entry was posted on February 16, 2015 by Stephen. It was filed under Shows and was tagged with dance, dinner, fundraiser, SDC.